We’ve all seen the World War II movies. The wave of dead bodies that seem like a Hollywood trick and not someone else’s family. I recently learned one of them was family on my mother’s side. A couple branches over on the family tree that made us third cousins, one generation removed. 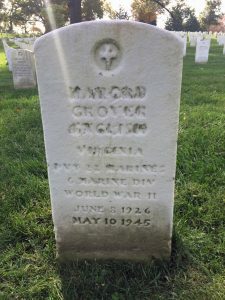 Harold Grover English died on May 10,1945 during the invasion of Okinawa. The sixth deadliest battle of World War II, and the deadliest in the Pacific theater, saw 82,000 American casualties, including more than 12,500 dead. The Japanese lost 110,000 and the civilian population lost 150,000. Harold was among the 6th Marine Division, Company K, 3rd Battalion, 22nd Regiment that cleared the northern part of the island. His nephew, who was born a few months later to the latter’s twin sister that married a soldier who served alongside Harold, told me little was known about how Harold died, only that the private was wounded in the early assault and later died. It felt like a gut punch reading this history. Harold is buried in Arlington National Cemetery’s Sec. 34, grave 2895. It’s a remote part on the eastern side of the cemetery where few visitors ever walk past. Harold’s stone near a large tree is so deteriorated that family has asked cemetery officials to replace it. I’ll be there whenever they do. Harold was only 19 years old. Part of the “Greatest Generation” that sacrificed so much with Harold sacrificing everything. But the story doesn’t end there. 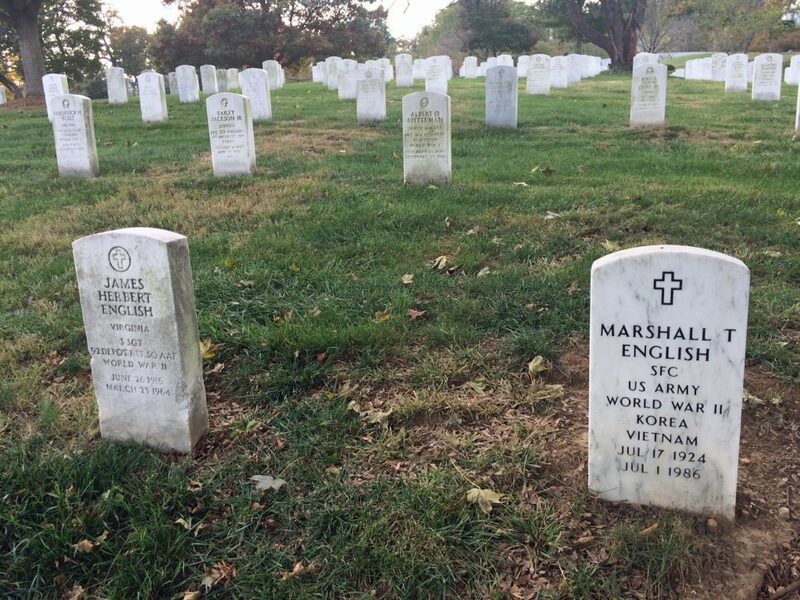 Harold’s brothers Marshall T. and James Herbert English are also buried at Arlington. James was a Staff Sergeant who was in the 92nd Depot and later died in 1964 at age 47. Marshall was a Sergeant First Class in the Army who served in World War II, Korea and Vietnam before dying in 1986 at age 61. Despite dying 22 years apart, the brothers lie aside each other in Section 31, Nos. 1391 and 1392. The two are in the section on the right as you approach John F. Kennedy’s eternal flame. While visiting the pair, a funeral arrived about 200 feet away. It’s unusual to see someone buried in that section nowadays. I failed to check the name on the day’s schedule, but my guess is that person was a spouse being buried with someone already interred. Having just been a pall bearer myself the previous week, I marveled at the preciseness of the unit coming down the slope more than 50 yards. It’s not as easy as they made it look. I now know of six family members buried at Arlington. I didn’t know of any until a few years ago. With my family’s long roots in Washington, I expect there are probably more I haven’t yet found. I didn’t know the English brothers, but take pride that they earned the right to be there. And, some pain knowing Harold died on the other side of the world before brought to Arlington. This entry was posted in Arlington National Cemetery and tagged Best Arlington National Cemetery walking tours, Photos by Rick Snider, Relatives buried at Arlington National Cemetery. Bookmark the permalink.